Histio UK » How is it Treated? What are the side-effects of the medication? What happens to patients after they had LCH? LCH is different to almost all cancers because in some cases it may ‘burn itself out’ without any treatment. We don’t know how or why this happens. In other cases, treatment is needed to get the disease under control and prevent too much damage. Treatment may involve an operation (surgery) and/or medication. The treatment will be tailored to your child and will depend on the extent and sites of their disease. What are the main treatment options? The diagnosis of LCH is made by taking a small sample of tissue from an affected part of the body (biopsy). If there is only a single bony lesion, the biopsy is sometimes combined with curettage (scraping out of the abnormal tissue in the lesion). These procedures may initiate a process of healing in the LCH lesion and sometimes this is all that is required. Steroids – corticosteroids are medicines used to reduce inflammation and stop the body’s immune system acting in the wrong way. Your child may be given prednisolone (a type of steroid) which is usually taken by mouth. Steroids can also be injected into an LCH lesion. Chemotherapy – this is used to destroy LCH cells and is generally given intravenously. This means that the chemotherapy medicine is diluted in fluid and given straight into a vein (into the bloodstream). 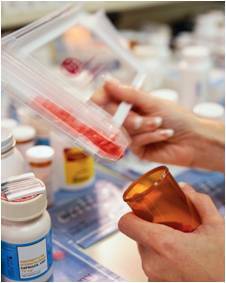 Some chemotherapy medicines may be taken by mouth. Your oncologist or haematologist will decide on a treatment plan for your child once all the relevant tests are completed. A protocol is a special plan that will detail your child’s treatment if medication is required. There are international treatment protocols, developed over many years through large clinical trials. The protocol will describe the frequency, timing and length of the different elements of treatment. Your child’s treatment plan may change since it is dependent on how he or she responds to the treatment. You will be given a copy of your child’s flow sheet so that you can follow progress throughout the treatment. If your child needs chemotherapy, he or she will probably need a central line. This is a tube that is inserted into a large blood vessel and tunnelled under the skin to where it can be easily accessed. It allows blood samples to be taken and treatment, including chemotherapy, to be given easily and painlessly. The central line is put in under general anaesthesia and can stay in place until the end of your child’s treatment. Your hospital will provide more information about the types of central lines they offer. If your child is unwell or requires very intensive treatment he or she will need to be in hospital. Most children however, receive all their intravenous treatment by visiting their hospital’s out-patient or day-care facility. This may only be available at your treating oncologist/haematologist’s hospital or it may be available at your local hospital under a shared care arrangement with a local doctor. Some treatment, like that taken by mouth, can be given at home. While on chemotherapy and for up to 6 months afterwards, your child will be susceptible to infections. This is known as being immunocompromised. If he or she develops a fever or becomes unwell you need to contact your treating team immediately for advice. Your child may need immediate hospital admission and treatment with antibiotics. The main drugs used to treat LCH and their common side effects are described below. Different drugs cause different side effects. Everyone is different and will react to treatment in a different way. Some children may have very few side effects while others will have a lot. Almost all side effects are only short-term and will gradually disappear once the treatment has stopped. • Steroids – Prednisolone/Prednisone - this is a type of corticosteroid (steroid) that can reduce inflammation and suppress the immune system. It is usually given by mouth, in the form of pills to swallow, pills that dissolve in water, or as a liquid medicine. Possible side-effects include: irritation of the stomach lining (indigestion/ discomfort/pain), increased appetite, weight gain, changes in behaviour (mood swings/difficulty in sleeping/anxiety/irritability), increase in blood sugar level (like someone with diabetes), high blood pressure, increased risk of infection due to suppression of the immune system, impaired wound healing, irregular or absent periods, and inflammation of the pancreas. • Chemotherapy – Drugs used to treat cancer. These drugs work by killing cells that are in the process of multiplying (by dividing and forming new cells). The main areas of the body that may be affected by chemotherapy are those where cells rapidly divide and grow. Examples include the lining of the mouth causing a sore mouth, the digestive system causing diarrhoea, skin and hair, causing hair loss, and the bone marrow (spongy material that fills the bones and produces new blood cells), causing low blood counts. Chemotherapy reduces the production, and therefore, the number of blood cells in the body. Too few red blood cells cause anaemia, and the person becomes tired and pale. If there are too few white blood cells, particularly ones called neutrophils (neutropenia), the person is at increased risk of infection. Too few platelets means the person is at increased risk of excessive bleeding when injured, having nose-bleeds or bruising easily. If the counts get really low, your child may need a red cell transfusion or platelet transfusion. Only a small number of LCH patients require transfusions, but in some more severe cases, transfusions play an important part in supporting patients. Transfusions are also needed to support those patients who undergo intensive chemotherapy. As the chemotherapy affects your child’s immune system, he or she may need antibiotics to help fight infections. This means, if your child has a temperature of 38°C or more or becomes unwell (even with a normal temperature), you should immediately contact your medical team. Your child may need tests, antibiotics and admission to hospital for a few days. You may also be asked to avoid using paracetamol and ibuprofen since these drugs lower high temperatures and may mask an infection. In addition, if your child is in contact with someone who has chickenpox, shingles or measles, then you should let your hospital know as these are potentially dangerous infections for a child with a low (suppressed) immune system. Both your child and the rest of your family should ideally have the annual flu jab during the autumn/winter. Chemotherapy can cause nausea and vomiting. Anti-sickness medicines, known as anti-emetic drugs, are given to control this side effect. Hair loss can occur, but this does not always happen with the chemotherapy used to treat LCH. Young children often get used to hair loss fairly quickly but for parents it is far more traumatic, reminding them that their child is ill. Fortunately, all hair loss from chemotherapy is temporary and hair growth returns once treatment has stopped. The chemotherapy normally used to treat LCH does not affect fertility, but you should discuss your child’s particular treatment with your oncologist/haematologist for more information. Chemotherapy can cause increased skin sensitivity to sunlight, therefore avoid intense sunlight and use sun block during treatment. The two most commonly used chemotherapy drugs for LCH are Vinblastine and 6-Mercaptopurine. – is a chemotherapy drug that is injected into your child’s blood stream through the central line. This drug is administered by a ‘push’ rather than a slow drip through. The process only takes about 10 minutes, but your child will be in hospital for longer since a number of checks need to be carried out before the drug is given. Once completed, your child will be able to go home. In addition to the side-effects previously described, Vinblastine can sometimes, though rarely, cause tingling sensations in the hands and feet, hoarseness, constipation, muscle weakness and bone pain. It may also cause damage to the skin if it is injected directly into a vein (rather than through a central line) and then leaks into the skin. 6-Mercaptopurine – is a chemotherapy drug taken either as tablets or in a liquid form. It is usually taken at home. In addition to the other side effects already mentioned, 6-mercaptopurine may affect the liver and this will be monitored by your doctor. Sometimes other drugs are used to treat LCH, for instance when the above mentioned drugs are not successful or when the disease returns. Should this become necessary, your doctor will discuss the different options with you. It is important to know that the vast majority of children will recover completely from LCH. Some children however, are left with persistent/recurring problems and for a very small number of patients with multi-system LCH, it can be a life-threatening condition. After successfully completing treatment, most patients will have follow-up clinic appointments. LCH sometimes comes back (‘reactivates’) and may need treatment again. If this happens, treatments for LCH that have worked for them before may be effective again. The same or different treatment may then be required. Patients are also monitored for possible permanent consequences of the disease (e.g. a low production of certain hormones) and may need treatment for these late effects.